Entertain your guests by serving up some delicious bar drinks from this Amish handcrafted home bar. Your house will be the new place to hang out while watching the game now that you have this heirloom quality piece of Amish craftsmanship as the new entertainment piece of your home. This Mission style home bar will provide plenty of good times, great drinks, and lots of laughs! You can practice your bar tending skills while relaxing at your own house with your closest friends and family. These features are perfect examples of the quality craftsmanship, detailed construction, and durable solid wood design exhibited by the talented Amish carpenters that handcraft each of these pieces of American made furniture. The bar shown has hand planed tops and is built from brown maple wood with Michael's Cherry Stain and heavy distressing. Have your bar built with the same beautiful wood and stain combination or have it custom made by choosing from oak, cherry, or brown maple as your wood type. Also choose your finish and hardware type for a look that will match your personal style and other home furniture. For more specific customizations, contact our DutchCrafters team with your ideas and dimensions. Our Amish woodworkers are always up for a challenge and will be happy to build a custom bar to fit your exact specifications. 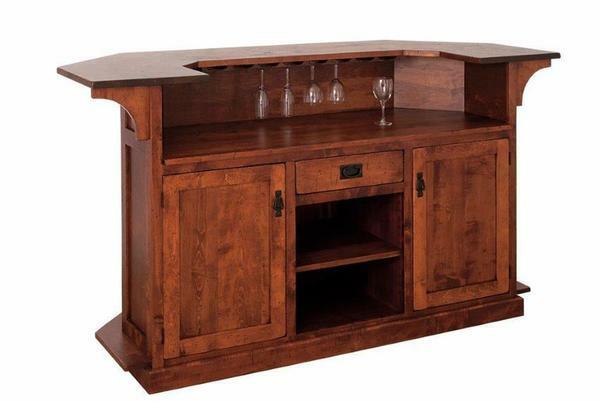 This expertly crafted solid wood home bar is sure be become the entertainment area of your home and will provide plenty of fun nights. Make sure to add a few of the matching Amish Mission Bar Stools to your custom bar order for a complete home bar setup. With a bar height of 42", make sure that you use bar stools with a height of 30" for a comfortable fit. Contact our DutchCrafters team of expert furniture specialists for custom ordering assistance on this stunning piece of Amish craftsmanship or to have wood and stain samples sent to your home or business to help make your custom ordering process a bit easier. Call toll free today Monday through Sunday at 1-866-272-6773.